This is such a simple meal to prepare and it makes for a great tasty midweek snack. Wash some rooster potatoes and cut into chunky wedges. Drizzle with a small amount of oil and some sea salt & cracked black pepper. Mix them all together in a bowl and place on a baking tray lined with parchment. Bake for 30-35 minutes until crispy and well cooked through to the centre. Shred the cabbage and break broccoli into smaller pieces and heat a large wok with a little butter or oil. Add the broccoli and cabbage, and stir fry for 4-5 minutes until just beginning to soften. If the mixture is cooking too quickly or getting browned add in 1 or 2 tablespoons of water to introduce a little steam to the dish and to aid cooking. Meanwhile mix the honey and the soy sauce together in a bowl and add this to the vegetable mixture. Cook for a further 3-4 minutes and season lightly with some salt and pepper. Heat a large pan with a little oil or butter. Cook the lamb loin chops on both sides for approximately 5 minutes until they are cooked to your liking (medium). If you prefer your chops a little more cooked allow them to cook for a few minutes longer on each side. 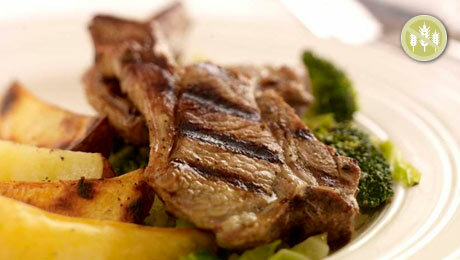 Serve the lamb loin chops on top of the stir fry and with the salt and pepper wedges. And if desired serve with a little garlic butter.